I am very excited and very nervous. I have been in many group shows but tomorrow we are hanging paintings for my very first solo show. It is in St. James Anglican Church in Dundas and I will be presenting over thirty of my paintings. 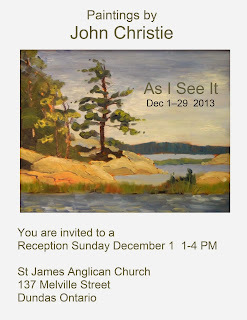 The opening is on Sunday at 1 pm and the show will run for the month of December. For more information about the show click on the invitation. My first ever "plein air" painting was painted at Primavera Farm. There was an old oak tree that I would have liked to have painted at the time but artists parked their cars at the base of it. I was elated when I was invited back so I went to paint the tree. It was 3 C with a gusty wind and the best vantage point was from an open field. I had to hold on to my paint box and my hands were pretty stiff when I finished but I managed a decent painting considering the conditions. I met with five other Ontario Plein Air Society artists to paint at Scottsdale Farm northwest of Toronto. It was another wonderful day. About 13 C and Sunny with cloudy periods. We painted from 11:00 until 3:30 PM. This painting was done first. The warm soft golden grass in the fields contrasted well with the cool green of the trees and the old fence. The second painting was rushed and I was already exhausted so I am not happy enough with it to post it. St James Anglican Church has supported local artists for many years. They fill their worship hall with artwork and open a new show on the first Sunday of every month. Many very accomplished artists have had shows here so I was very excited three years ago when they invited me to show. The three years has passed and so it is show time. I am now very excited and very nervous. It is one thing to have four or so paintings hanging in a show where they are supported by the works of other artists but for this show I will be hanging over thirty of my paintings and they have to stand all on their own. On top of that all where painted in one sitting and all but one were either painted from a sitting model or on location. I accept that painting "still lifes" is a great exercise and good practice but I love people and being outdoors so I get no great joy out of painting a still life. The second Wednesday of every month the BFAA sets up a still life in the studio. I am not very good at painting them probably because it is work for me but they do help me to practice looking more and painting less. I haven't been down here in years. It is another very quiet valley leading into Burlington Bay. It was about 8 C with only a bit of wind so I was quite comfortable. The clouds were thick with only occasionally a hole where the sun could peek through. The scene presented a bit of a challenge because the marsh was almost devoid of water and I had no idea how to make it read as mud. I scraped the foreground off more than a couple of times before I finally managed one that I was okay with. We have a lot of marshes and mud flats in this area so I really need to work on painting them. It was another great day to paint. About eight of us met to paint at Princess Point today. It was cool (about 3 C) and mostly cloudy. My hands got cold but not so cold that they affected my painting. I am pleased with this. I think that I managed to capture the mood of the day towards the end of the painting period. The light was starting to get low and had a nice warm glow. A major wind storm came through southern Ontario and we were down by Cootes Paradise painting with the wind howling over our heads. We had arranges to meet Martha Laverty Allan , another Ontario Plein Air Society member who is visiting from the Ottawa area, and we were determined to paint. The clouds were billowing in the wind and every once in a while the sun would come out and light up a section of the landscape. I was pleased with this painting and it is starting to grow on me.